Celebrate First Party Insurance Claim Education & Advocacy at the Public Adjuster Event of the Season!! All 50 spots are sold out but there are still some unique marketing opportunities available for this popular event. Click above to learn more or call us at 866-235-6489, today! See you in the Keys! Overseas Highway is recognized as one of the best scenic drives in the Country. If departing Miami or Fort Lauderdale airports, take kthe Florida Turnpike South until it ends at Overseas Highway (US1). Take US 1 South to mile marker 61; turn left into Hawks Cay Resort on Duck Key! Register Now!It's absolutely gorgeous and you're going to love it! What to Wear with So Much To Do! Get ready to enter the Land of Flip-Flop Formal! When the mossy smell of the Everglades turns into briny sea and a hazy film of salt starts to form on your windshield, don't stop to wipe it off! Just turn up the music! The Overseas Highway will take over from here. It looks as if you're driving on top of the ocean (you are) and its at this point in your journey that you'll realized you've arrived. It's The Florida Keys! Visit the Calm Waters Spa (FAPIA guests receive a 10% discount). Kids will have a blast at the Coral Cay Recreation Space and you will love the outdoor activities and amazing food options. Visit the Dolphin Connection Team and swim with the five resident dolphins! 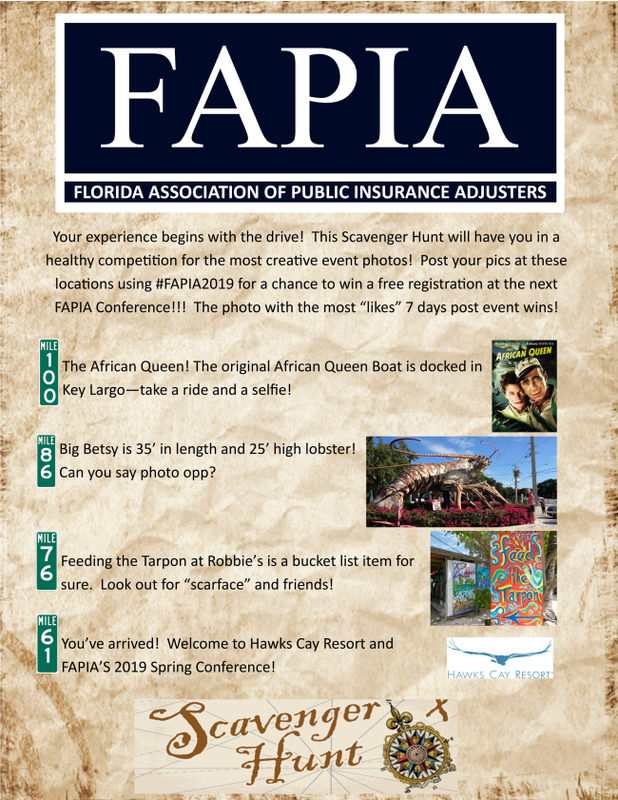 Do You Remember When FAPIA was @ Hawks Cay? Join us for the public adjuster event of the season! The Florida Association of Public Insurance Adjusters is celebrating 26 years of Education and Advocacy of our industry in the Florida Keys next Spring at the amazing Hawks Cay Resort on Duck Key in the beautiful Florida Keys! Get ready for three days of the BEST public adjuster education available in one of the most beautiful spots in the state of Florida. We will have our traditional reception, delicious food, our traditional Florida Keys fishing tournament and hook and cook! We will welcome some very special surprise guests that you won't want to miss!!! Rooms are almost entirely sold out. There are still some three bedroom villas left! Sunday, June 2nd, 2019 @ 8:30 a.m.
Sunday, June 2nd from 6:30 to 8:30 p.m.
REGISTER FOR THE HOOK AND COOK DINNER BUFFET!